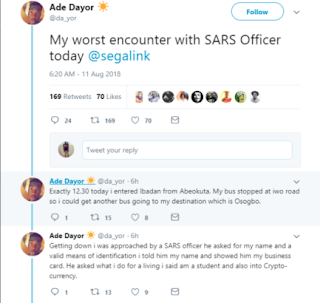 A Nigerian student simply identified as @da_yor on Twitter has taken to the platform to narrate how he was extorted by some SARS officers who called him a yahoo boy after checking his bitcoin wallet. 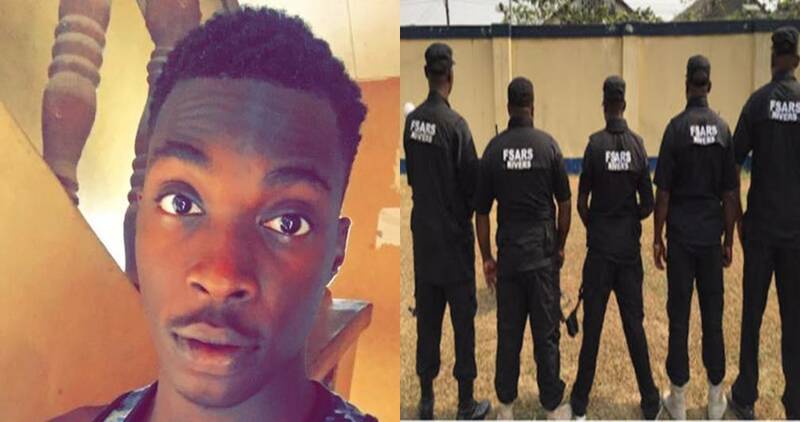 According to the Nigerian student, the incident occurred at Iwo Road in Osun State after he alighted from a bus going to board another going to Osogbo area of the state. 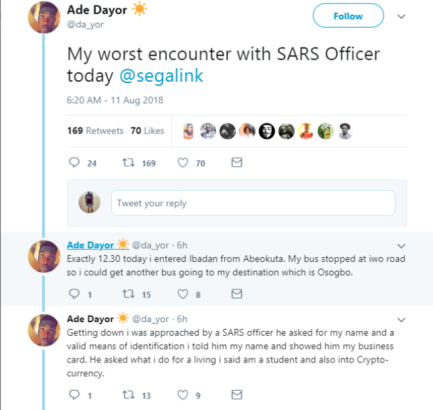 My worst encounter with SARS Officer today @segalink. Exactly 12.30 today i entered Ibadan from Abeokuta. My bus stopped at iwo road so i could get another bus going to my destination which is Osogbo. Getting down i was approached by a SARS officer he asked for my name and a valid means of identification i told him my name and showed him my business card. He asked what i do for a living i said am a student and also into Crypto- currency. He immediately asked for my phone and i was open to give it to him he checked over and over again and saw nothing. But my transactions and bitcoin wallet since he saw bitcoin transactions he tagged me a yahoo boy. He said “See the way him dress he wear designer him be yahoo boy”I was still in shock and next thing he forced me into their car nd took me to their station at AYEPE. Got their the so called station was empty nd it was just the three officers from the point where they stopped me. Asked them for a valid means of identification but they refused to show me, he asked me for 50k to bail myself and he would allow me leave. 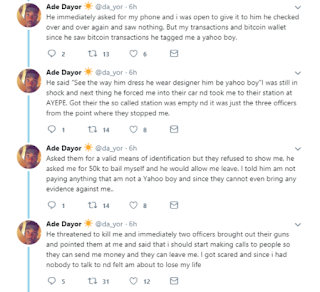 I told him am not paying anything that am not a Yahoo boy and since they cannot even bring any evidence against me.. He threatened to kill me and immediately two officers brought out their guns and pointed them at me and said that i should start making calls to people so they can send me money and they can leave me. I got scared and since i had nobody to talk to nd felt am about to lose my life. 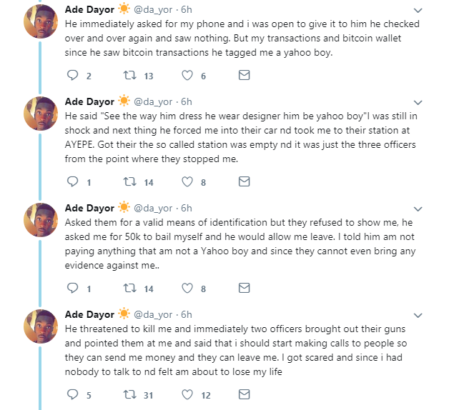 After that i made some calls to friends and was able to raise some money they took me over to the WEMA BANK along new ife road and forced me to withdraw 17,000. They are really becoming a threat to the society. So right now in Nigeria you cannot dress well again ? If you dress well automatically that makes you a Yahoo boy. They look like thieves no identity card or any other means of identification. I was surprised a law enforcement officer could go this length to extort money from me since he had gun to threaten me and threatened to waste my life all in the name of taking money from me.